This invention relates to the isomerization of xylenes in a Ca fraction which also contains ethylbenzene. In a process widely practised commercially, and described inter alia in U.K. Specification 1,444,481, such xylenes are isomerized in the vapour phase employing a catalyst containing a zeolite such as ZSM-5 in the acid form. In this process the described conversion of ethylbenzene -always present in C8 fractions- is now known to be accomplished by its disproportionation, over the catalyst, to benzene and diethylbenzene. However, since it is catalyst acidity which is responsible for this disproportionation there is a limit upon the extent to which this conversion can be permitted to proceed, since xylene losses (by their disproportionation) increase with increasing catalyst acidity. It has, furthermore, been proposed to employ as reforming catalysts catalytically active forms of a member of a family of crystalline metal organosilicates which are characterized by the X-ray diffraction pattern of zeolite ZSM-5 and in which the molar ratio of alumina to silica is in the range of 0 to less than 0.005 AIz03 to more than 1 mole of Si02. We have now found that ethylbenzene can be converted by a reaction mechanism which is not strongly dependent on catalyst acidity, and that since the xylene isomerization reaction itself does not require a high level of catalyst acidity, given appropriate conditions, that reaction can be so conducted as to avoid loss of xylenes by disproportionation whilst simultaneously converting ethylbenzene to a desirable extent. According to the present invention a process for isomerizing xylenes mixed with ethyl benzene by contact in the presence of hydrogen at conversion conditions with a catalyst comprising a zeolite having a constraint index of 1 to 12, is characterized by the fact that the zeolite has a silica/alumina ratio of at least 500 and the conversion temperature is above 426°C (800°F). The preferred zeolites are ZSM-5 itself and ZSM-5 (ccM), particularly ZSM-5 (ccPt). They are advantageously employed in composited form, the zeolite constituting from 1 to 99, preferably 5 to 80, weight percent of a composite with a binder. The temperature range usually employed is 426 to 538°C (800 to 1000°F), and the zeolite silica/alumina mole ratio can range up to 3000. The significance and definition of "constraint index" has been widely disseminated in the patent literature, for instance in DTOS 2,438,252. The process of the invention thus uses a zeolite of low alumina content, and therefore of low acid exchange capacity, which may also contain metals such as platinum or nickel. To compensate for the lower acid activity of the catalyst the temperature is raised to 426°C (800°F), or higher to effect xylene isomerization. At these temperatures, ethyl benzene reacts primarily via dealkylation to benzene and ethane rather than via disproportionation to benzene and diethyl benzene, a mechanism fairly independent of catalyst acidity. Since ethyl benzene conversion is less dependent on the acid function, a lower acidity catalyst can be used to perform the relatively easy xylene isomerization, and the amount of xylenes disproportionated is eliminated. The reduction of xylene losses is important because about 75% of the xylene stream is recycled in the loop resulting in an ultimate xylene loss of 6-10 wt.% by previous processes. Since most of the ethyl benzene goes to benzene instead of benzene plus diethyl benzenes, the product quality of the new process is better than that of prior practices. The new process also allows greater flexibility with respect to charge stock. Since ethyl benzene conversion is relatively independent of isomerization, high ethyl benzene containing charge stocks can be processed, which means that charge stocks from thermal crackers (about 30 wt.% ethyl benzene) can be used as well as conventional stocks from reformers. In addition, dealkylation of C2 alkyl groups is favored since the temperature is above 426°C (800°F). As a result, paraffins in the charge stock will not alkylate the aromatic rings, eliminating xylene loss via this mechanism. Thus, this new process can process paraffins in the charge by cracking them to lighter paraffins eliminating the need for their removal by techniques such as extraction. Finally, a smaller portion of the cracked fragments are recombined to form new aromatic rings which results in a net increase of aromatic rings. The single figure of the drawing is a flow sheet of a typical xylene isomerization plant for processing C8 feeds, in which the invention may be applied. Referring to the drawing, the charge introduced by line 4 is a mixture of eight carbon atom alkyl aromatics, namely ethyl benzene and the three xylene isomers. Such charge stocks are derived from catalytic reformates, pyrolysis gasoline, etc. by distillation and solvent extraction to separate aromatic compounds from aliphatics. The present process has the ability, unique among xylene isomerization processes, of converting paraffins, olefins and the like which are separted by the normal distillation facilities of an isomerization loop. This process is therefore capable of accepting charge materials which contain substantial quantities (say up to 15%) of aliphatic hydrocarbons. Other sources for production of xylenes include toluene disproportionation and methylation of toluene, which are acceptable charge stocks in combination with fractions which contain ethyl benzene. Such charge stock passes by line 4 to a xylene splitter column 5. The bottoms from the xylene splitter, constituted by o-xylene and Cg aromatics passes by line 6 to the o-xylene tower 7 from which o-xylene is taken overhead at tine 8 and heavy ends are removed by line 9. The overhead from xylene splitter column 5 is transferred to conventional crystallization separation 10 through line 11. The crystallizer operates in the manner described in U.S. Specification 3,662,013. Because its melting point is much higher than that of the other C8 aromatics, p-xylene is readily separated in the crystallizer after refrigeration of the stream and a xylene mixture lean in p-xylene is transferred to an isomerization unit through line 12. The isomerization charge passes through a heater 13, is admixed with hydrogen admitted through line 14 and the mixture is introduced to the reactor 15 operated in a manner presently to be described. Isomerized product from reactor 15 is cooled in heat exchanger 16 and passes to a high pressure separator 17 from which separated hydrogen can be recycled in the process. The liquid product of the isomerization passes by line 18 to a stripper 19 from which light ends are passed overhead by line 20. The remaining liquid product constituted by C8 + hydrocarbons is recycled in the system by line 21 to the inlet of xylene stripper column 5. It will be seen that the system is adapted to produce maximum quantities of p-xylene from a mixed C8 aromatic feed containing all of the xylene isomers plus ethyl benzene. The key to efficient operation for that purpose is in the isomerizer which takes crystallizer effluent lean in p-xylene and converts the other xylene isomers in part to p-xylene for further recovery at the crystallizer. The reactor 15 contains a crystalline aluminsolicate (zeolite) catalyst of relatively low acid activity by reason of its very high silica/alumina ratio of 500 or higher. That catalyst, which is preferably combined with a metal from Group Vlll of the Periodic Table promotes a reaction course which is unique at temperatures upward of 426°C (800°F). Ethyl benzene in the charge is selectively cracked to benzene and ethane at little or no conversion of xylenes. The two conversions are, as noted above, decoupled such that, for the first time, reaction severity is not a compromise to achieve effective ethyl benzene conversion at "acceptable" loss of xylene. This characteristic of the process renders unnecessary the preliminary distillation to separate at least some of the ethyl benzene from the feed stream as practiced in prior processes. It has been further found that the present process has capability to convert paraffin hydrocarbons. This makes it possible to dispense with the expensive extraction step conventionally applied to the C8 aromatic fraction of catalytically reformed naphthas in the manufacture and recovery of xylenes. In taking advantage of this feature, the feed stream at line 4 will contain the Cµ aromatics of a reformate or the like together with the paraffins of like boiling range, mostly nonanes. The paraffins in the charge are hydrocracked to lighter paraffins, including ethane, which will come off separator 17 with the recycle hydrogen in much greater quantity than that resulting from conversion of ethyl benzene. This requires modification of the usual techniques for maintaining concentration of the recycle hydrogen stream by withdrawal of a drag stream, not shown in the drawing. The flow sheet of the drawing contemplates separate recovery of o-xylene. It will be immediately apparent that this isomer may be recycled in the system in the event o-xylene is not a desired product. In that event, splitter tower 5 is operated to take o-xylene overhead with the other Cµ aromatics and take only Cg as bottoms from tower 5. The preferred zeolites for use according to the invention are zeolites having lattice structure of the type of the well known zeolites ZSM-5, ZSM-11, ZSM-12, ZSM-35 and ZSM-38, identified respectively in U.S. Specifications 3,702,886, 3,709,979, 3,970,544, 4,016,245 and 4,046,859. A particularly preferred form of zeolite ZSM-5 is obtained by crystallization of the zeolite from a solution containing metal ions. Such ZSM-5 variants obtained by co-crystallization of metal and zeolite which we designate ZSM-5(ccM)- have proven particularly effective in the process of the invention where the variant is one -ZSM-5(ccPt)- containing 0.2 to 0.8 wt.% platinum. These values were determined by standard techniques. The radiation was the K-alpha doublet copper, and a scintillation counter spectrometer with a strip chart pen recorder was used. The peak height, I, and the positions as a function of 2 times theta, where theta is the Bragg angle, were read from the spectrometer chart. From these, the relative intensities, 100 I/lo, where 1. is the intensity of the strongest line or peak, and d (obs. ), the interplanar spacing in A, corresponding to the recorded lines, were calculated. 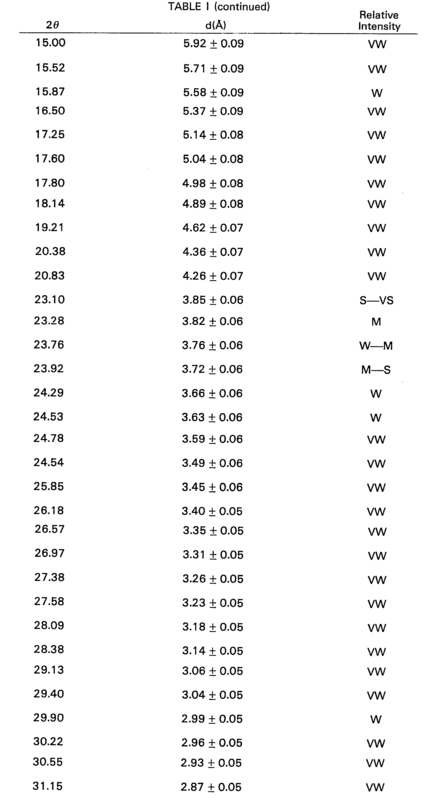 In Table I the relative intensities are given in terms of a subjective evaluation. It should be understood that this X-ray diffraction pattern is charateristic of all the species of ZSM-5 (ccM) compositions. Ion exchange of the sodium ion with cations reveals substantially the same pattern with some minor shifts in interplanar spacing and variation in relative intensity. Other minor variations can occur depending on the silica to alumina ratio of the particular sample and the extent of thermal conditioning. Typical reaction conditions consist of heating the foregoing reaction mixture to a temperature of from about 95°C to 175°C. for a period of time of from about six hours to 120 days. A more preferred temperature range is from about 100°C. to 175°C. with the amount of time at a temperature in such range being from about 12 hours to 8 days. The digestion of the gel particles is carried out until crystals form. The solid product is separated from the reaction medium, as by cooling the whole to room temperature, filtering and water washing. The foregoing product is dried, e.g. at 110°C (230° F), for from about 8 to 24 hours. Of course, milder conditions may be employed if desired, e.g. room temperature under vacuum. The specific zeolites described, when prepared in the presence of organic cations, are catalytically inactive, possibly because the intracrystalline free space is occupied by organic cations from the forming solution. They may be activated by heating in an inert atmosphere at 538°C (1000°F), for one hour, for example, followed by base exchange with ammonium salts followed by calcination at 538°C (1 OOOOF) in air. The presence of organic cations in the forming solution may not be absolutely essential to the formation of this type zeolite; however, the presence of these cations does appear to favor the formation of this special type of zeolite. More generally, it is desirable to activate this type catalyst by base exchange with ammonium salts followed by calcination in air at about 538°C (1000°F) for from about 15 minutes to about 24 hours. Natural zeolites may sometimes be converted to this type zeolite catalyst by various activation procedures and other treatments such as base exchange, steaming, alumina extraction and calcination, in combinations. 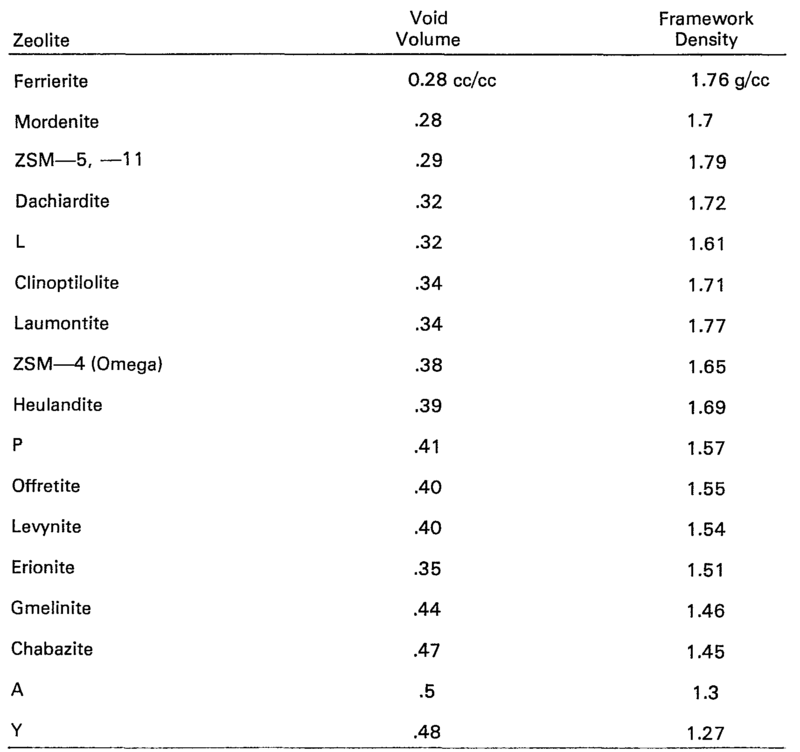 Natural minerals which may be so treated include ferrierite, brewsterite, stilbite, dachiaridite, epistilbite, heulandite, and clinoptilolite. In a preferred aspect of this invention, the zeolites hereof are selected as those having a crystal framework density, in the dry hydrogen form, of not substantially below about 1.6 grams per cubic centimeter. It has been found that zeolites which satisfy all three of these criteria namely constraint index, silica/alumina ratio, and crystal density, are most desired. Therefore, the preferred zeolites of this invention are those having a constraint index as defined above of 1 to 12, a silica to alumina ratio of at least 500 and a dried crystal density of not less than about 1.6 grams per cubic centimeter. The dry density for known structures may be calculated from the number of silicon plus aluminum atoms per 1000 cubic Angstroms, as given, e.g. on page 19 of the article on Zeolite Structure by W. M. Meier. This paper, the entire contents of which are incorporated herein by reference, is included in "Proceedings of the Conference on Molecular Sieves, London, April 1967," published by the Society of Chemical Industry, London, 1968. When the crystal structure is unknown, the crystal framework density may be determined by classical pyknometer techniques. For example, it may be determined by immersing the dry hydrogen form of the zeolite in an organic solvent which is not sorbed by the crystal. It is possible that the unusual substained activity and stability of this class of zeolites is associated with its high crystal anionic framework density of not less than about 1.6 grams per cubic centimeter. The high density, of course, must be associated with a relatively small amount of free space within the crystal, which might be expected to result in more stable structures. This free space, however, is important as the locus of catalytic activity. When synthesized in the alkali metal form, the zeolite is conveniently converted to the hydrogen form, generally by intermediate formation of the ammonium form as a result of ammonium ion exchange and calcination of the ammonium form to yield the hydrogen form. In addition to the hydrogen form, other forms of the zeolite wherein the original alkali metal has been reduced to less than about 1.5 percent by weight may be used. Thus, the original alkali metal of the zeolite may be replaced by ion exchange with other suitable ions of Groups IB to VIII of the Periodic Table, including, by way of example, nickel, copper, zinc, palladium, calcium or rare earth metals. In practicing the desired conversion process, it may be desirable to incorporate the above described crystalline aluminosilicate zeolite in another material resistant to the temperature and other conditions employed in the process. Such matrix materials include synthetic or naturally occurring substances as well as inorganic materials such as clay, silica and/or metal oxides. The latter may be either naturally occurring or in the form of gelatinous precipitates or gels including mixtures of silica and metal oxides. Naturally occurring clays which can be composited with the zeolite include those of the montmorillonite and kaolin families, which families include the sub-bentonites and the kaolins commonly known as Dixie, McNamee-Georgia and Florida clays or others in which the main mineral constituent is halloysite, kaolinite, dickite, nacrite or anauxite. Such clays can be used in the raw state as originally mined or initially subjected to calcination, acid treatment or chemical modification. In addition to the foregoing materials, the zeolites employed herein may be composited with a porous matrix material, such as alumina, silica-alumina, silica-magnesia, silica-zirconia, silica-thoria, silica-beryllia, silica-titania as well as ternary compositions, such as silica-alumina-thoria, silica- alumina-zirconia, silica-alumina-magnesia and silica-magnesia-zirconia. The matrix may be'in the form of a cogel. The relative proportions of zeolite component and inorganic oxide gel matrix may vary widely with the zeolite content ranging from between 1 to 99 percent by weight and more usually in the range of 5 to 80 percent by weight of the composite. In order that the invention may be more clearly understood some preferred embodiments of it are set forth by way of illustration in the following Examples. The product contained 0.23% platinum in ZSM-5 (cc Pt) of 660 silica/alumina. After crystallization was complete, the crystals were separated by filtration, washed with water. dried, base exchanged with ammonium cation and calcined at about 538°C (1000°F). The resultant catalyst had a silica/alumina ratio of 1041 and contained 0.76 wt.% platinum. A mixture of hydrocarbons was prepared which simulates charge to the isomerizer 15 in an operation charging at line 4 of the drawing, a fraction prepared by distillation from catalytic reformate to include the C8 aromatics. 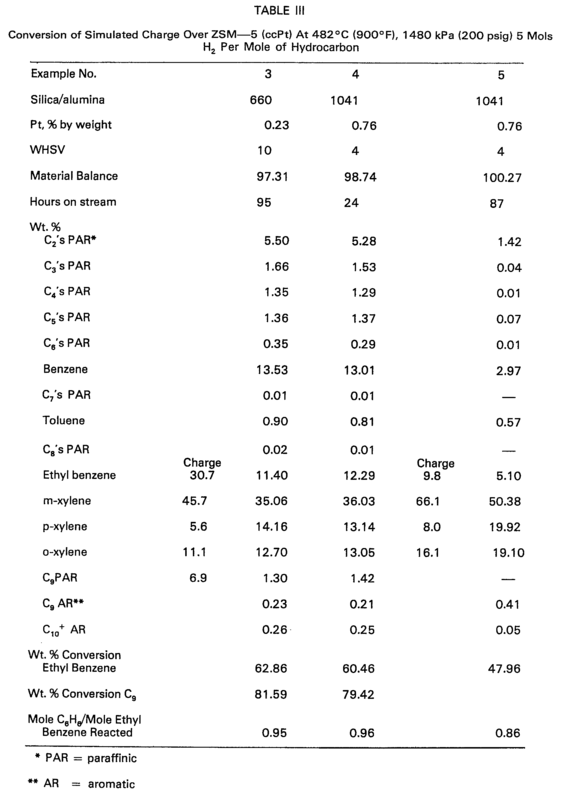 The simulated charge contained 6.9% n-nonane, 30.7% ethyl benzene and 62.4% of a mixture of xylenes poor in p-xylene, viz. 73.3% m-xylene, 17.8% o-xylene and 8.9% p-xylene. That mixture was reacted over the catalyst of Example 1. 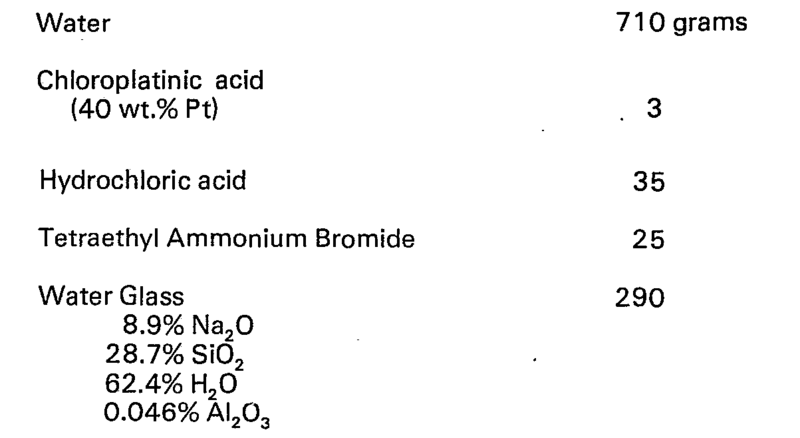 Reaction conditions and products of the reaction are tabulated in Table III. The same charge as in Example 3 was processed over the catalyst of Example 2, with results as shown in Table III. A simulated charge was prepared by blending 9.8% ethyl benzene with 90.2% of mixed xylenes having the composition set out in Example 3. That charge approximates the isomerizer feed in a system supplied with fresh feed prepared by fractionation of catalytic reformate to separate a Ca aromatics cut and solvent extraction to reject the paraffin content of the fraction. Results are shown in Table III on processing the simulated charge over the catalyst of Example 2. It will be noted from the experimental data in Table III that reactions of ethyl benzene are predominantly by conversion to benzene as contrasted with disproportionation reactions which yield diethyl benzene. Although it is known that diethyl benzene can be reacted to chemical raw materials having a present market value as such, in practice the diethyl benzene is diverted to fuel use in motor gasoline and the like. The present process yields benzene as the heavily predominant product to the significant economic advantage of the overall process. It has been demonstrated that the conditions (catalyst, temperature) induce dealkylation of ethyl benzene by charging ethyl benzene alone. There are indications that dealkylation of ethyl benzene in the presence of xylene has a favorable effect on selectivity of conversion of ethyl benzene to benzene. The data are not adequate to establish a true "cause and effect" relationship but the trend of data do indicate that the ethyl benzene conversion is more selective for benzene as product when xylenes are present, despite the observed lack of the usual relationship of coupling wherein degree of xylene conversion to other compounds (xylene loss) tends in the same direction as ethyl benzene conversion. The reaction is found to proceed in the direction indicated with metal free high silica zeolite, but is less selective than when the zeolite is associated with a metal of Group VIII. Also shorter catalyst life is to be expected with metal-free zeolite catalyst. Particularly preferred are the noble metals of Group VIII, namely platinum, palladium, osmium, iridium, ruthenium and rhodium. The other Group VIII metals, such as nickel exhibit the advantages of the invention to less extent, in some cases by minor increase of xylene loss at conditions to promote increased ethyl benzene conversion, with some apparent coupling of the reactions. The metal should be a minor component of the catalyst, say 0.05 to 2.0 weight percent and is preferably highly dispersed. For purposes of achieving dispersion of metal, the catalyst is preferably of the ZSM-5 (ccM) variety wherein the metal is present in the forming solution from which the zeolite is synthesized. When metal is applied to a fully formed zeolite, as by impregnation with conventional techniques, care must be exercised. The quantity of metal should be relatively low, say up to 0.2 weight percent. At moderate to high metal content, e.g. 0.3 to 1.0 weight percent platinum, applied by impregnation the catalyst exhibits tendency to loss of benzene rings, apparently by hydrocracking, possibly on relatively large crystals of metal within the pores of the catalyst. These problems are largely alleviated when the metal-bearing zeolite is of the ZSM-5 (ccM) variety and all the metal content is derived from metal compounds in the synthesis liquor. 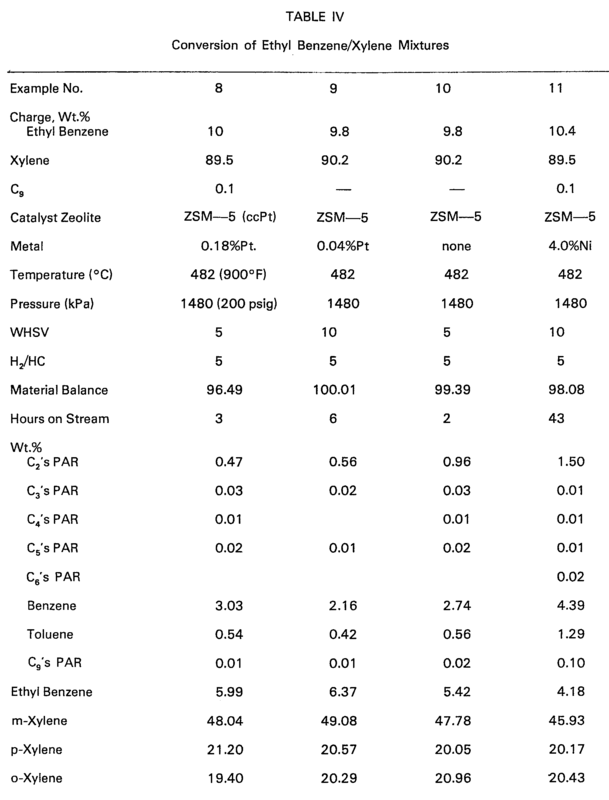 Following conversion to the hydrogen form by ammonium base exchange and calcining, portions of the zeolite were impregnated with 0.4 weight percent platinum. A further ZSM-5 catalyst was prepared by impregnation of zeolite having 1600 silica-alumina ratio with 4.0 weight percent nickel, blending with 35 weight percent alumina and extrusion. Catalyst prepared according to Example 6 and 7 were employed in processing ethyl benzene mixed with xylene in which the distribution of isomers was as described in Example 3. Conditions and results obtained are summarized in Table IV. 1. A process for isomerizing xylenes mixed with ethyl benzene by contact in the presence of hydrogen at conversion conditions with a catalyst comprising a zeolite having a constraint index of 1 to 12, characterized in that the zeolite has a silica/alumina ratio of at least 500 and the conversion temperature is above 426°C (8000F). 2. A process according to claim 1 wherein said zeolite is of the structure ZSM-5. 3. A process according to claim 2 wherein said zeolite ZSM-5 has been synthesized from a forming solution in which platinum is present, and said zeolite ZSM-5 contains 0.2 to 0.8 wt.% platinum. 4. A process according to any preceding claim wherein said zeolite constitutes from 1 to 99, preferably 5 to 80, weight percent of a composite with a binder. 5. A process according to any preceding claim which is carried out at a temperature of 426 to 538°C (800 to 10000F). 6. A process according to any preceding claim wherein said zeolite has a silica/alumina mole ratio of 500 to 3000. MX2015012209A (en) * 2013-03-15 2015-12-01 Bp Corp North America Inc Mfi aluminosilicate molecular sieves and methods for using same for xylene isomerization. Free format text: 980720 *MOBIL OIL CORP.